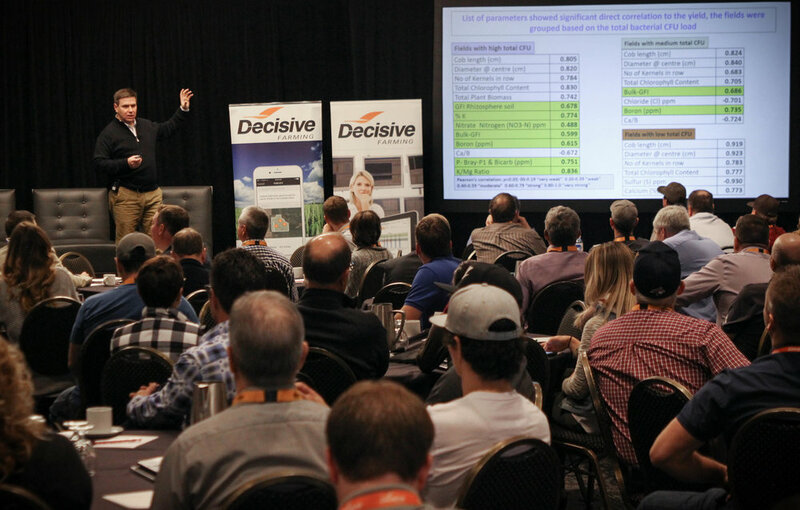 The Quantified Farm Conference, presented by Decisive Farming, is an annual conference that connects producers and industry professionals from the across the agriculture industry. The 2017 conference hosted over 200 attendees from across Alberta, Manitoba, Saskatchewan and the United States on December 6-7, 2017 at The Rimrock Resort Hotel in Banff, Alberta. This year’s conference theme was the Spirit of Farm Innovation. Sessions focused on giving attendees a glimpse into the future of technology in agriculture. Speakers presented topics such precision ag, the future of farm to fork and changes in farm technology. The ‘Twittersphere’ was buzzing about farm innovation using the #QuantifiedFarm hashtag. With 73 unique users, the hashtag reached over 78,000 users and generated over 100,000 impressions. Over a 28-day period surrounding the conference, visits to Decisive Farming’s Twitter profile increased by 183% and they earned 50 new followers. Norbert Beaujot, an inventor and founder of Seed Master, kicked off the conference by revealing DOT Power Platform, an autonomous seeder. This keynote was rated by attendees as their favourite! Another favourite session was the panel led by Trish Myers of Federated Co-op Limited on food sustainability and the future of farm to fork. We learned that producers feel that the word sustainability is more of a “buzz word” crafted by marketers and it doesn’t resonate positively. Trish Meyers from Federated Co-operatives Limited moderating a panel with Earl Greenhough, Koch Fertilizer; Mike O’Dea, INTL FCStone; and Matt Hamill, Red Shed Malting. Kevin Swan, VP of Solium who grew up on a beekeeping farm west of Edmonton, presented the closing keynote titled “the mystique of farm innovation.” He shared about the innovation lifecycle and touched on the value of bitcoin and the cryptocurrency markets that will affect every industry, not just agriculture. When attendees explain their main reason for attending a conference, we are used to unanimously hearing that they attend to network. This group was different. Quantified Farm Conference attendees were there, first and foremost, to learn something new to take back to their farm or their career supporting ag. To wrap up the conference, attendees headed downtown for custom cocktails and distillery tours at Park Distillery. The event was spread out on both levels of the bar, with casual food stations meant for grazing or meeting someone new at the long picnic-style tables (there was even a poutine bar and a s’mores station!) PARK mixed some of the best cocktails in Banff, made with liquor prepared in-house and offered distillery tours throughout the evening. Want to see what you missed? Check out the conference photos by Andrew Hardingham on Decisive Farming’s Facebook page.